1. You MUST log in to your Stonewall membership account to renew your membership. 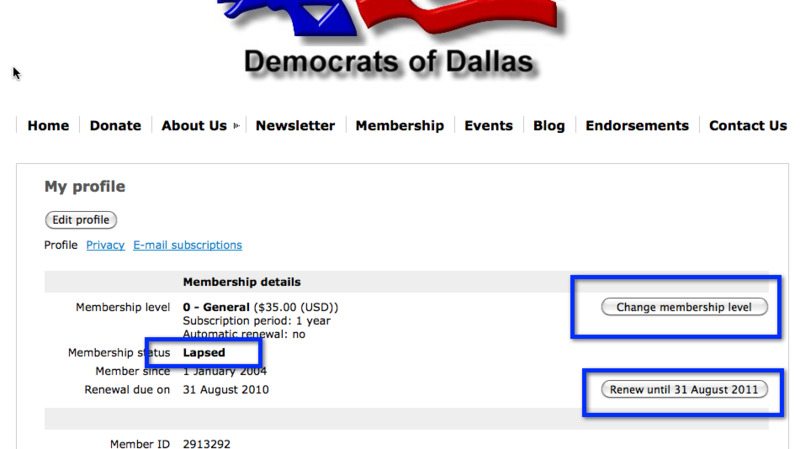 Once you are logged in to your Stonewall Democrats of Dallas account (Login form located in the upper-right corner of our homepage) you will see your account status next to your name. (If you don't know your password follow these instructions to reset your password). In the example below, the status shows lapsed. Click on view profile to be taken to your profile page so that you can renew your membership! 2. On your profile you can view information about your account, including your status and membership level. 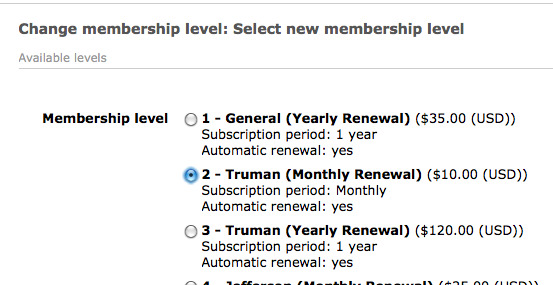 If your membership has lapsed, you'll have the option to change your membership level and renew your membership. If you are just renewing, click on the "renew until" button and follow the instructions. If you wish to become a sustaining member, click on the "Change membership level" and choose the level you want to change to. Once you've chosen the new level, follow the instructions and you will now be a sustaining member.